This article is about cities in China throughout history of China. For cities controlled by Republic of China after 1949, see List of cities in Taiwan. According to the administrative divisions of the People's Republic of China including Hong Kong and Macau, there are three levels of cities, namely provincial-level (consists of municipalities and SARs), prefecture-level cities, and county-level cities. As of January 2019 the PRC has a total of 674 cities: 4 municipalities, 2 SARs, 293 prefectural-level cities (including the 15 sub-provincial cities) and 375 county-level cities (including the 38 sub-prefectural cities and 9 XXPC cities) not including any cities in the claimed province of Taiwan. 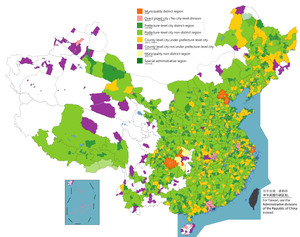 Based on 2010 census data, the largest cities are the four centrally administered municipalities, which include dense urban areas, suburbs, and large rural areas: Chongqing (28.84 million), Shanghai (23.01 million), Beijing (19.61 million), and Tianjin (12.93 million). According to 2017 research from the Demographia research group, there are 102 cities controlled by People's Republic of China with an "urban area" population of over 1 million. See article: Chinese city tier system. other small and medium cities are grouped into Tier III or IV cities." Note: All names are transliterated in pinyin. Before 1921 all cities in China are classified as Fǔ (Chinese: 府; urban prefecture) means an office or a command institution. ^ 中华人民共和国行政区划. gov.cn. Government of the People's Republic of China. Retrieved 7 March 2015. ^ "More than 100 Chinese cities now above 1 million people". Guardian. March 20, 2017. ^ "Chinese First Tier Cities, Second Tier Cities and Tiered Cities in China". Starmass. Starmass. 28 April 2011. Retrieved 7 April 2014. ^ Liu, Sindy; Perry, Patsy; Moore, Christopher; Warnaby, Gary (28 August 2015). "The standardization-localization dilemma of brand communications for luxury fashion retailers' internationalization into China". Journal of Business Research. 69 (1): 357–364. doi:10.1016/j.jbusres.2015.08.008. ^ Liu, Sida; Liang, Lily; Michelson, Ethan (April 2014). "Migration and Social Structure: The Spatial Mobility of Chinese Lawyers". Law & Policy. 36 (2): 165–194. doi:10.1111/lapo.12016. ^ "一二三四线城市最新划分弄清楚了！你家乡是什么级别？ ——凤凰网房产北京". house.ifeng.com (in Chinese). Retrieved 2018-07-12. ^ Mali Chivakul; Raphael W. Lam; Xiaoguang Liu; Wojciech Maliszewski; Alfred Schipke (April 28, 2015). "Understanding Residential Real Estate in China" (PDF). imf.org. International Monetary Fund. pp. footnote 6, page 4. Retrieved June 11, 2015. Chinese cities are generally grouped into four categories: Tier I cities include Beijing, Shanghai, Guangzhou, and Shenzhen; Tier II cities include Beihai, Changchun, Changsha, Chengdu, Chongqing, Dalian, Fuzhou, Guiyang, Haikou, Hangzhou, Harbin, Hefei, Huhhot, Jinan, Kunming, Lanzhou, Nanchang, Nanjing, Nanning, Ningbo, Qingdao, Sanya, Shenyang, Shijiazhuang, Suzhou, Taiyuan, Tianjin, Urumqi, Wenzhou, Wuhan, Wuxi, Xiamen, Xi'an, Yinchuan, cities.